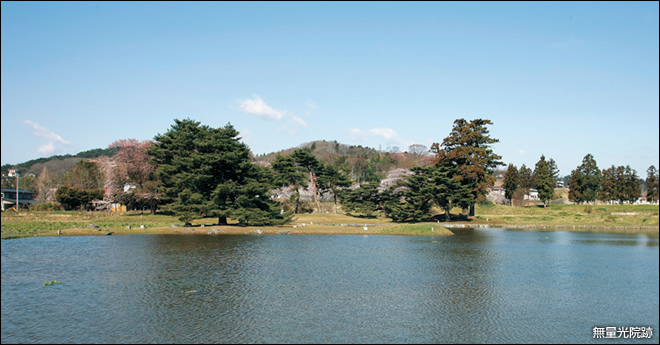 This is the site of the temple the third Fujiwara lord Hidehira built to imitate the Phoenix Hall of Byōdō-in Temple in Uji. Research has shown that the distances between pillars in the Amida hall and the transepts on both sides were larger than those of the Phoenix Hall, so it seems that there was an ambition to surpass the Byōdō-in Temple. Twice a year, the center line of the hall is aligned with the sun setting behind Mount Kinkeisan to the west, creating an image of the Pure Land of Ultimate Bliss. It is said to be one of the greatest Pure Land Garden masterpieces.